Pink area signifies Winter Storm Warning. Purple area is for the Winter Weather advisory. 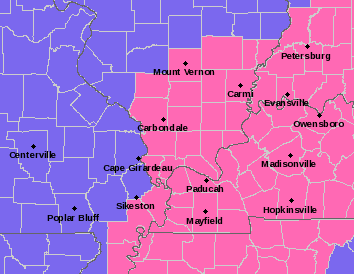 A WINTER STORM WARNING IS IN EFFECT FROM 9 PM THURSDAY TO 9 PM FRIDAY FOR MUCH OF SOUTHERN ILLINOIS, SOUTHWEST INDIANA AND THE MISSOURI BOOTHEEL. Isolated to scattered power outages and tree damage may occur due to the ice accumulation. Travel will be dangerous, including during the morning commute on Friday. Total snow accumulations 1 to 3 inches may occur on top of up to one quarter inch of ice accumulations. A WINTER WEATHER ADVISORY IN EFFECT FROM 9 PM THURSDAY TO NOON ON FRIDAY FOR MOST OF SOUTHEAST MISSOURI AND SOUTHERN ILLINOIS, MAINLY NORTH OF INTERSTATE 64. Mixed precipitation expected. Snow and ice will result in difficult travel conditions, including during the morning commute on Friday. Total snow accumulations of up to one inch, on top of total ice accumulations of up to two tenths of an inch are expected. Conditions are forecast to deteriorate fairly quickly from about 8:30 p.m. to 10 p.m. from southeast Missouri into southern Illinois. By 10 p.m. we should see freezing rain in a band from around Fairfield, IL to Marion, IL to Cape Girardeau and Poplar Bluff in southeast Missouri, changing over to sleet.